Scandinavia is a region in Northern Europe which covers five countries of Denmark, Finland, Norway, Sweden and Iceland and boasts great tradition and long history in design and craftmanship. Meanwhile, these Nordic countries have developed strategies to protect traditional handicraft and spared no effort to combine traditional handicraft with modern industrial design. The tradition, as an inherent spiritual philosophy, is presented in the form of modern design, and embodies the design aesthetics of Nordic designers. Thus, Nordic design has made great achievement and is reputed as the “Global Design Paradigm”. It has been one of the academic orientations of He Xiangning Art Museum to focus on and hold the international design art exhibition. 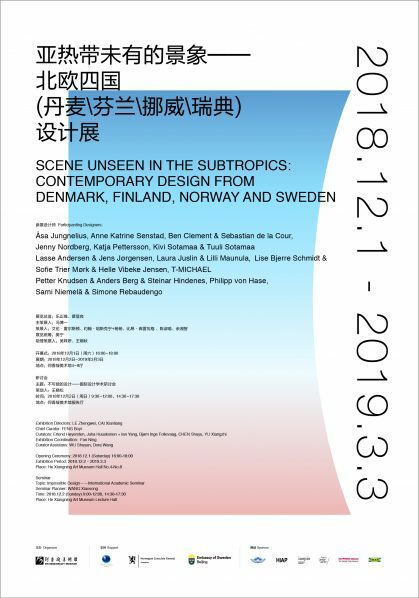 Therefore, they hold an exhibition themed with “Unseen Vision in Sub-tropical Area—Four Nordic Countries (Denmark, Finland, Norway and Sweden) Design Show”. With the effort of curators from China and the four Nordic countries, they co-host exhibition, seminars and public education promotion activities combining the current design status in Shenzhen and China at large. They aim to offer an opportunity for the public and design industry professionals to learn about the panorama of design industry in these four Nordic countries, especially their latest progress in different design fields, so that Shenzhen and China at large could communicate and discuss with the design professionals in these four Nordic countries. From that, they could learn about their strength and weakness of their own design and resolve problems confronting us. Their goal is to improve the general standard of Chinese local design and encourage it to connect with international design in different dimensions. Courtesy of the He Xiangning Art Museum, for further information please visit www.hxnart.com.